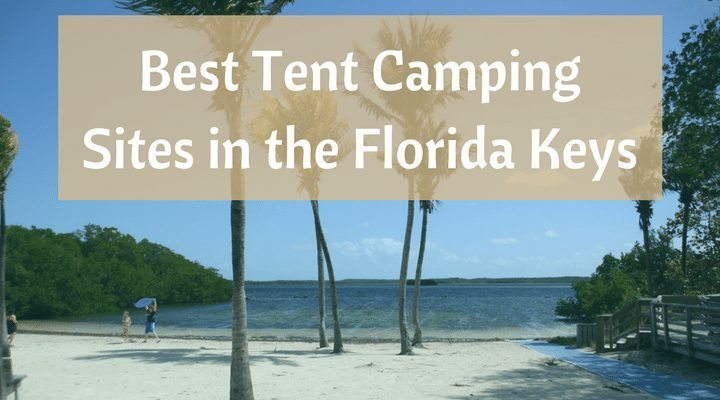 If you have finally chosen your destination for your camping getaway down in the beautiful FL Keys, but are still struggling to pick the campsite, we have put together a list of our top five tent camping sites to help guide you to pick the right one for you. Whether you are with your friends, family, on a romantic getaway or looking for some time alone, we have the perfect campsite to fit what you are looking for. 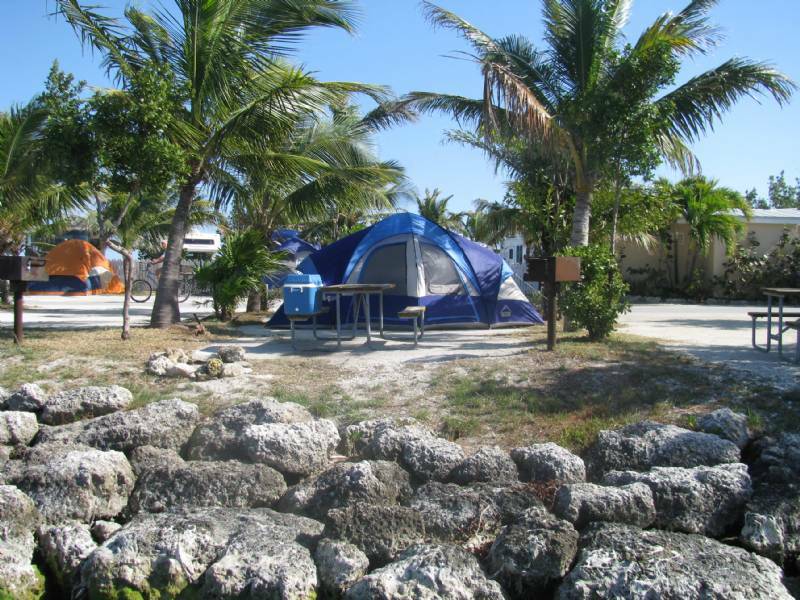 This park, located near the Florida Keys National Marine Sanctuary, was not only the first undersea park in the entire U.S., it also continues to offer amazing features that a campsite can give you when it is that close to the natural beauty of Florida. It is located and includes water area so you can enjoy various water-based activities. The park is approx. 25 miles long, but also covers 178 miles of coral reefs, swamps and seagrass beds. 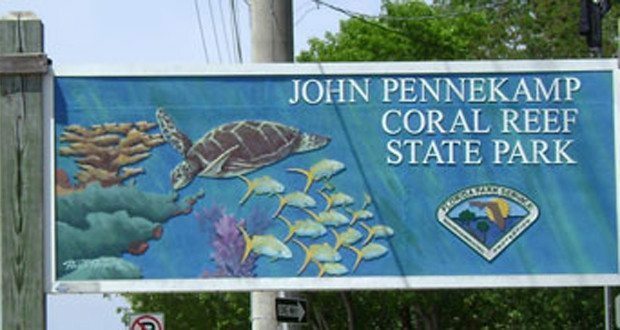 If you are looking for water activities and to get close with nautical nature, John Pennekamp Park is a great place to set up your tent. There are 47 full facilities on-site for campers with tents and with RVs. You and your family can enjoy fishing, swimming and picnicking. There are also available boat trips where visitors can scuba dive out in the ocean on a glass bottom boat or near a shipwreck located 100 feet offshore of Cannon Beach. You can also take out kayaks and paddle boards and paddle through the mangroves on a small excursion. A common complaint was the possible overcrowding of tent area and had to tent on gravelly ground. All visitors in the park are charged an entrance fee of $8.00 per vehicle with a max. of 8 people in the vehicle. $2.00 for cyclists and pedestrians or extra passengers. For camping, it is $36 a night plus $6.70 reservation fee. This park spreads out over 60 full facility campsites with picnic areas and two nature trails to hike, the Golden Orb, which covers a 1.1 mile distance and the Layton Trail, which is a great access point for bayside waters. The campsite faces the beautiful Atlantic ocean and has a sandy ground with a bit of grass for comfort. It also offers a large range of activities available for campers. The shallow waters surrounding the state park are a great opportunity to go kayaking, canoeing, swimming and snorkeling. Campers are also welcome to fish, though a license is required. There are also lots of picnic tables and grills available along the shoreline for visitors and campers alike. 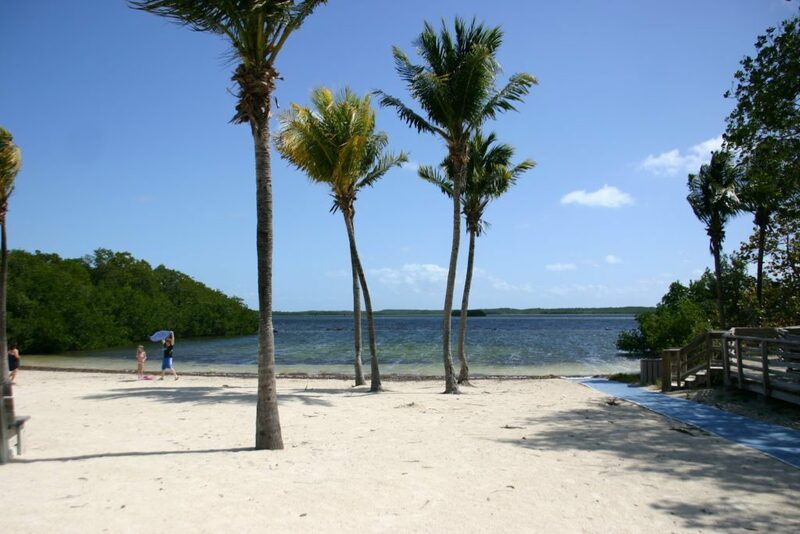 Long Key Park also boast their site as a great location to go Geo-Seeking. Geo-Seeking, or geocaching can be played throughout the park and is low costing for a lot of fun. This park is also located on the Great Florida Birding Trail, which can be a great opportunity to view wildlife. A common complaint was that there were no boat ramps available. All visitors are $5.00 per vehicle and $2.50 for pedestrians and cyclists. Campers pay $43 per night including taxes. Over 500 acres of park is at your disposition to explore. The area not only includes the award winning beach, which you can take a plunge in and swim, but also an offshore island, which has great opportunities to snorkel and engage in water and non-water related activities. On-site, there is a gift shop, available kayak rentals, tours that will take you snorkeling and a snack bar. Not only is camping available, a total of 80 campsites(! ), there are also hot showers and restrooms on-site and available. You can take your family or friends on a 3.5 mile bike ride or go with them on a saltwater fishing excursion (licensing, of course is required). 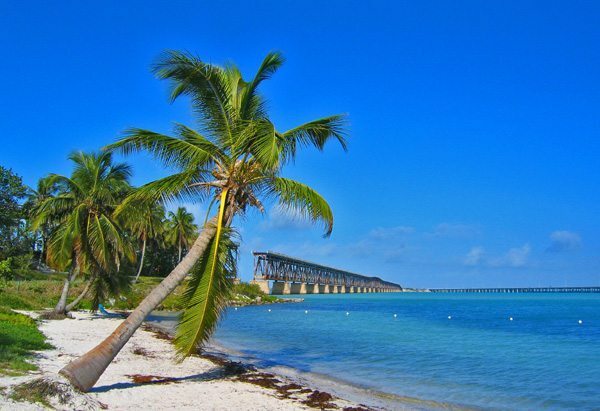 The Bahia Honda State Park is a fantastic environment looking out on the beach and boasts a very sandy terrain and a nature trail. The park is also quite private, though it is pretty popular and can get a bit crowded, there are native plants that provide screening between sites. A common complaint was that there is road noise from the intercostal highway bridge nearby and not enough laundry facilities. Another complaint was about the bugs, but if you are traveling down to the Keys, or anywhere in Florida, bugs are everywhere you go. On this beachfront area, there are activities to entertain and please everyone in the family, from beautiful cruises at sunset to relaxing fishing to fun activities for the kids. There is a waterfront veranda to enjoy your time truly and with a carefree attitude, as a vacation should be! The Key West tourist area is just a shuttle ride away to the “Conch Republic”, if you want to step away from the campsite life and explore the city. There is a pool area, bike and boat rentals available and an actual on-site bar, which seems to be a great hit with the visitors. A common complaint was the wifi being $2.00 a day, but if you are camping, who truly needs Wi-Fi? Campers in tents pay $60 a night, but the place is known to own up to its value. 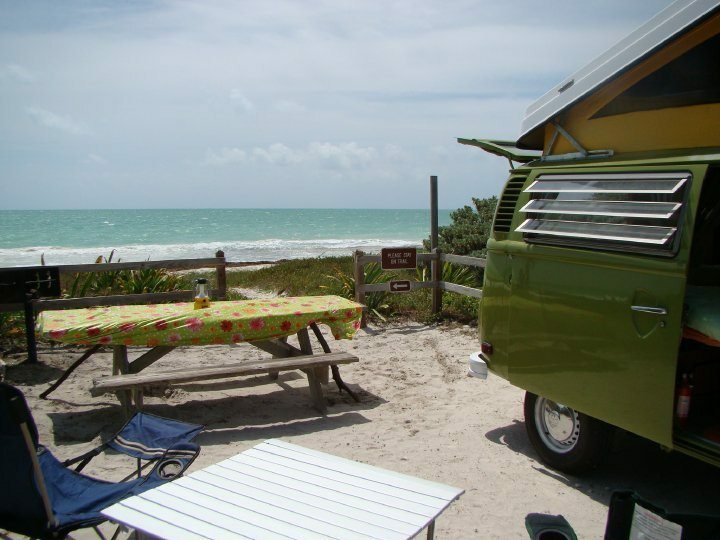 The terrain is sandy, there are nice facilities, including showers, washers and dryer and sinks for clothes and dishwashing, and Sugarloaf Key West KOA has been known to be one of the cleanest campsites in the Florida Keys, well maintained and the staff seems to be extremely attentive and helpful. The site is located right on the beach of the Florida Keys. 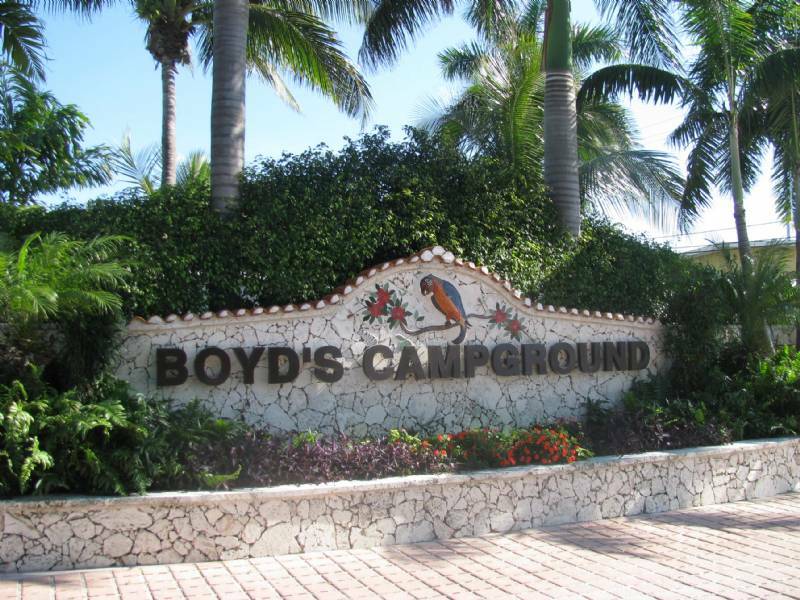 Facing the oceanfront and only a few minutes from civilization, Boyd`s West Campground offers all the amenities of a finely built and equipped campground for you or your family and loved ones to enjoy. 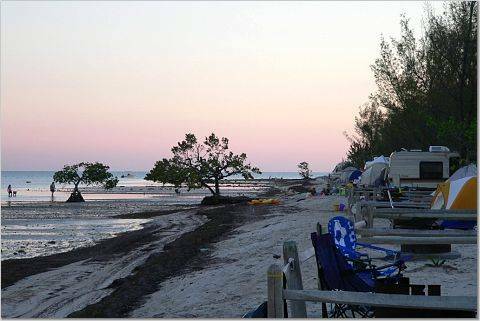 The campground boasts a relaxing pool area (heated for the rare cool months), snorkeling in the ocean, fishing availabilities, diving into the deep Key waters and access to the beach area so there is something to do for everyone. There is a boat ramp and docks for your convenience, a game room for the kids, a poolside Tiki Hut with a big screen TV for the big kids, and a picnic pavilion with grills available for the whole family. There is free Wi-Fi, a convenience store on site, a marina and four clean and kept bathhouses, with laundry facilities and dishwashing stations. If you are looking to escape to the city life, there are bus services that will take you directly to and from your destination. However, staying on-site will not disappoint, there is no shortage of activities to occupy the entire family at any age. There are craft classes, yoga and aquasize classes for those looking to keep fit, ice cream socials for the kids and potluck dinners for the whole family. There is live music, pool parties and food for any age and fashion shows, ladies luncheons, and camper appreciation cookouts to keep things interesting. There are also movie nights, line dancing and day trip excursions. For the evening, there are sunset and casino cruises leaving from the site for your night out. For tents in season (Oct. 15- Apr. 30), the prices range from $66-82 a night, depending if you want an inland or waterfront site. For the off season, prices range from $58-$68 a night. 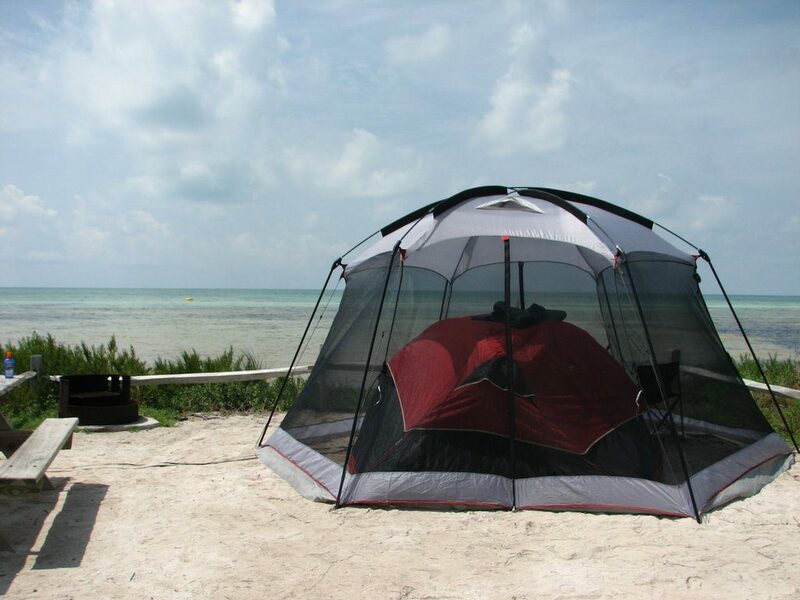 If you are looking for a campsite in the Florida Keys that is perfect for your family, solo or couple vacation, this list should help you pick from our top five choices. Enjoy your trip, drink responsibly and have fun!